Hi, friends! 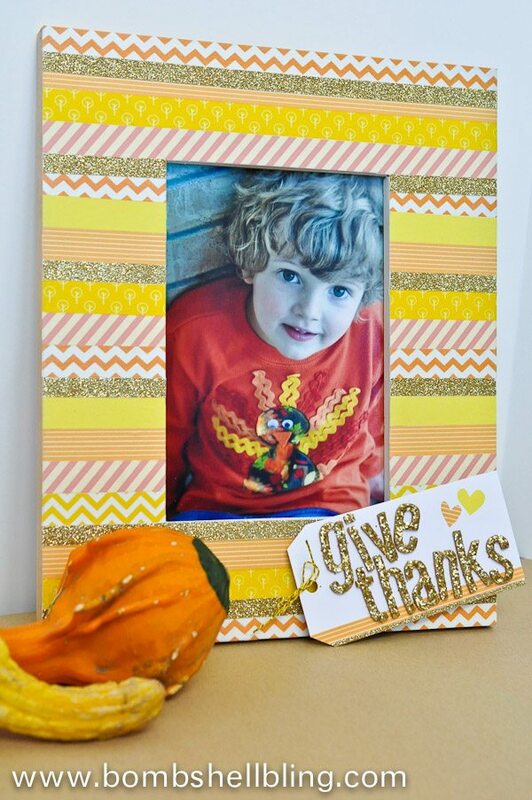 I am so excited to share with you today the Give Thanks Frame that I made to display my favorite picture of my son last year wearing his silly Rick Rack Turkey Shirt (you can find the tutorial for that HERE). I have never gotten very “into” Thanksgiving before, and I have certainly never decorated, but this year I have been thinking a lot about the meaning behind Thanskgiving and have decided to turn over a new leaf and try to decorate for it and truly embrace the Thanksgiving season as more than just the month shoved in between my two favorite holidays. As you know, I am a bit addicted to making striped washi tape holiday frames. I have made them for Halloween and the Fourth of July, and I’m quite certain that I will be making some for Christmas as well. I know myself. I am a creature of habit. And also, I love glitter. It’s a problem, really. Ok, now let’s do this thing! It’s time to getter done. Begin by painting your wooden frame white. Technically this is optional, but I always do this because washi tape is usually very thin, and I don’t like how the wood grain shows through on the lighter washi tapes. By painting the frame white it creates a uniform “canvas” for the washi tape. I also painted the edges gold just for fun because I knew I was working gold glitter tape and stickers into the design. I usually just paint the sides white as well because I am lazy like that. Now just start taping! You can use a variety and it does NOT have to be in a specific order or pattern. In fact, I prefer it when they aren’t in a precise pattern. Randomness is fun, dontcha think? The nice thing about washi tape is that you can readjust it if you need to, so you can work on it until it is just right.. It’s a lot like masking tape, just in case you didn’t already know. 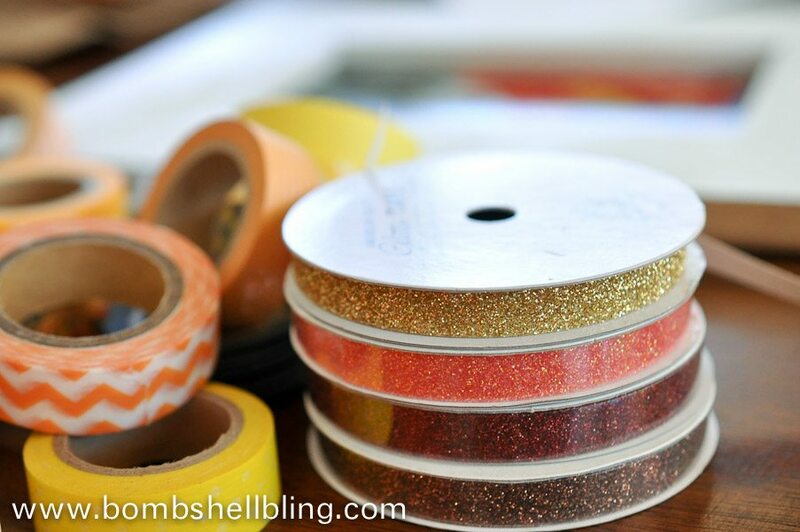 (Glitter tape is NOT adjustable like that, though, so be precise with that!) I leave my edges hanging off, as shown above, and trim them all at once when I am satisfied with my layout. At this point if you are not making the tag embellishment then your frame will be totally finished. SERIOUSLY. 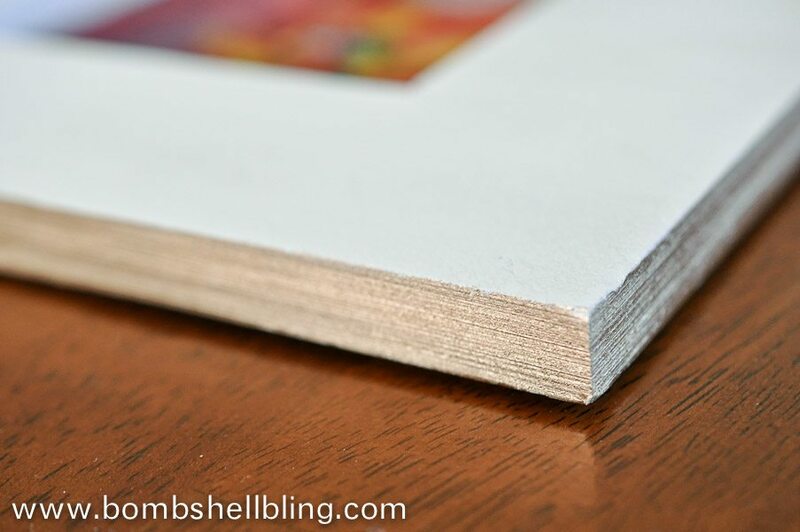 Add a thin layer of decoupage (Mod Podge) that extends over the corners a bit and allow it to dry to seal the tape down permanently. 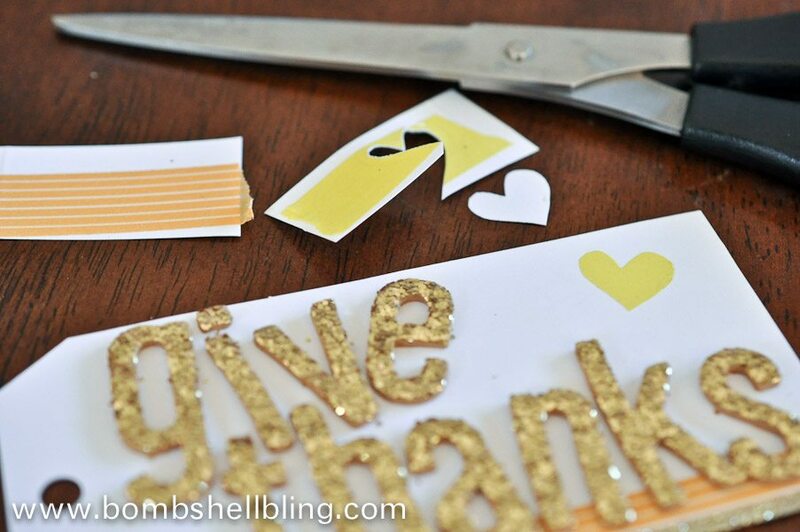 If you would like to add a tag embellishment then cut a tag shaped piece of cardstock. Mine is about 4.5 x 2.5 inches. I added a bit of washi tape to the bottom and a bit of glitter tape, as you can see, just as a fun embellishment and to tie it all together. 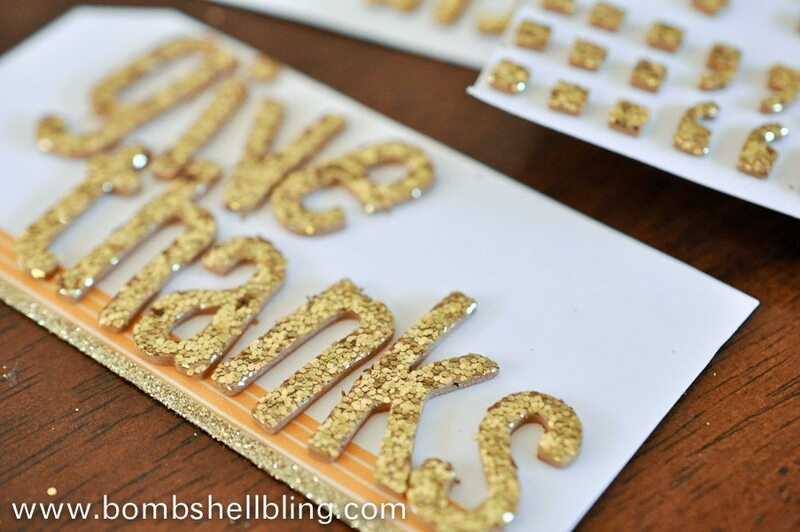 I used some glittery Thickers (by American Crafts) for the letters to spell out “Give Thanks,” which I did have to peel off and move a couple of times. I love those Thickers—I’m addicted to them! I felt like something was “missing” from the tag because the corner was so empty, so I decided to add a couple of hearts using washi tape. To add the hearts I put a small piece of two different colors of washi tape on a scrap of my white cardstock, just so that it would be easier to cut. Them I simply cut out a couple of hearts, CAREFULLY peeled the washi off of the cardstock heart and transferred it to the tag. As you can see, they are not perfect, but I’m cool with that. Finish your tag by punching a hole it in and tying on a bit of baker’s twine or ribbon. You can use a glue stick or a thin layer of the decoupage to attach the tag where you want it. All done! I love that you can use the colors and little touches that you love to customize frames like this. I have a whole mess of washi tape because, well, I have craft supply hoarding problems, and I just piled them on the table and picked and chose tapes that I thought would compliment the picture the best. I love that about creating my own home decor! That’s cute. Your son is a doll too. Better watch out when he is older. 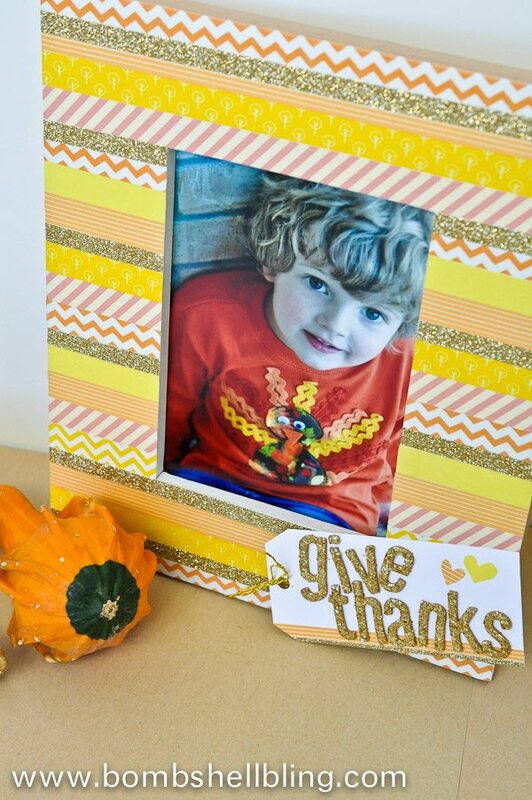 I love the colors and embellishments you added to the frame. Mainly I just love the whole thing. I love this. 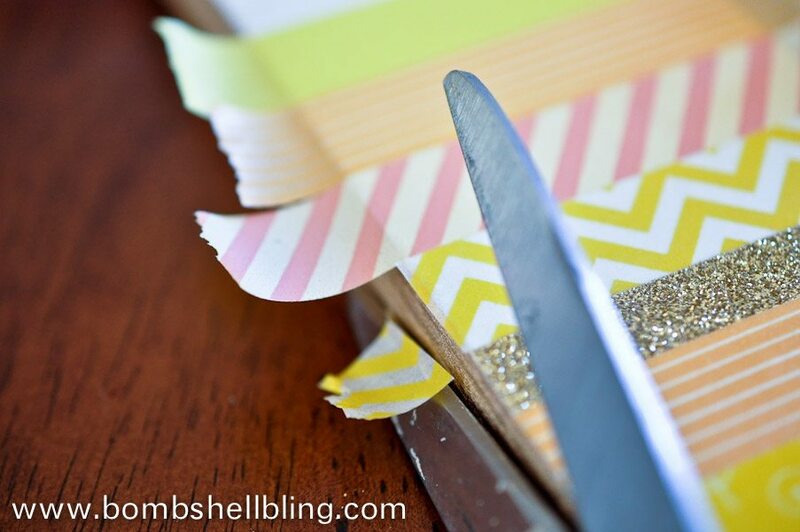 What a fun use of washi tape. 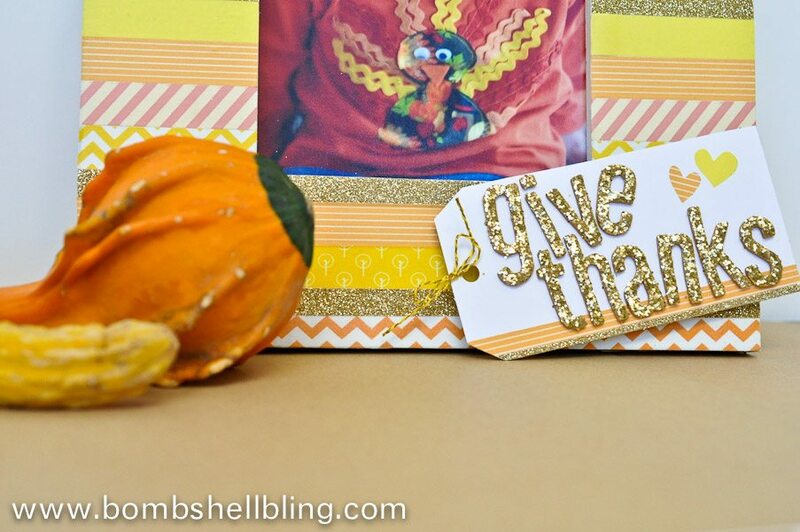 Love the frame (I love thanks and I love glitter….so it is perfect for me)! Thanks for sharing your creativity and joy! Nice project, thanks for sharing on craft schooling Sunday! Super cute and this looks very doable, too! Thanks for sharing this on Throwback Thursday!